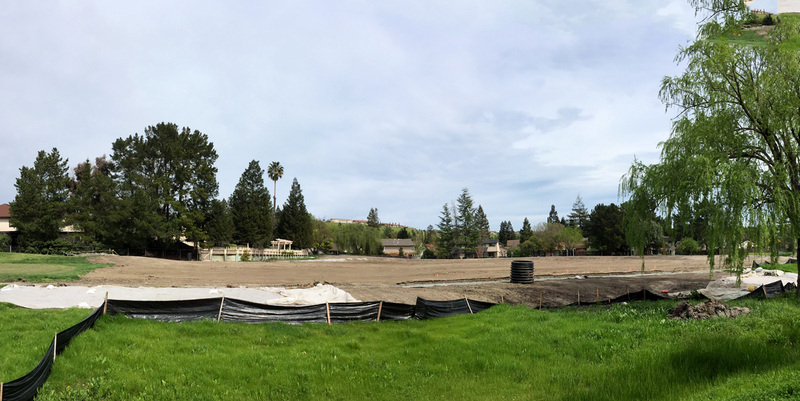 Have you been wondering what has been happening behind the green fencing on fairways 11, 12, 13 and 17 for the Faria Project riparian habitat creation? Here is what part of the 13th fairway has looked like over the past few months looking over a fence. What isn’t visible is a new large drainage. Most of the sod has been replaced and I am sure further work has happened this past week. In short, the work appears very close to completion which should mean that the back nine would be available for golf looking better than ever. With the construction complete the fences should also go away. If you want more background on why the riparian habitat work was done in the first place you can read about that here. For the details of what is being done to create the habitat see the bottom of the page in the very last text box. Tip o’ the Stay the Course hat to Geoff Ho for the text and photos! That was Geoff Ho’s handiwork. I just stitched his nice photos together. Do we know if the plan is to open the full course after completion of this project? Hoping so. That will definitely make a lot of people happy! Any ideas when the cyclone fencing will come down? Thanks for the comment and photos.also I have texted several times asking about the meetings.when are they and can anyone attend?. The meetings happen more or less monthly. We post a notice on the blog. The last meeting was 4/6. I’ll put up the minutes as soon as I get them from the Secretary. Anyone is welcome to attend, but we do ask that you let us know ahead of time, as we rent space in the Senior center for the meetings and don’t want to jam too many people into the room we normally get. The best way to contact us is by clicking on the Contact tab on the blog. The comments come directly to me by email. I don’t recall having seen any messages from youbut I may be mis-remembering. Thanks for photos. Just curious if you have photos for all the work done on 18th hole (outside what was permitted). If you don’t have, I certainly do.